Yes, I've been watching Pillars of the Earth--the series finale is on tonight and I'll have to pant in anticipation on Netflix over my (so far) work-free weekend because we don't have Starz. As I've been reading Elizabeth Chadwick lately, an author who writes in the medieval period from Conquest down to The Anarchy (which is when Pillars takes place) to Angevin kings to Bad King John and his sinking treasure, Pillars fits in with that time period. Most of the historical romances I read take place in England, during the Regency Era, among the upper classes. Thus, many of them have titles. In Romancelandia, there seem to be a dearth of dukes running around England, all of them young, hot, single,rich, with names like Raven-this and Hawk-that, etc. So, to be a little bit more realistic--and because at heart, while I might like reading about the upper classes, I can't say I'm particularly fond of the idea that the upper 1% holds more than half the wealth in a nation (oh, wait, that's our country)--my "romance novels" have a minimum of titles in them. I mean, come on, Jane Austen wrote about the gentry, who were plenty landed and usually, well-off. And there were more gentry than aristocracy, so....that's where I went, for the most part. Gentry and rich merchants. I was just reading a post on a favorite blog about an author's voice...and how it may, or may not, change as the author matures and becomes more fine-tuned. I finished the outline of the third book in my romance novel series last night. These being the same stories I was fiddling with last summer (seriously--the whole series is planned). I wrote the first one through, submitted it to a contest, got some pointers and honest-to-goodness feedback on the first 35 pages. Then I got into Last Request and left the Regency historical novels on my desktop. Well, the spark came back about a month or two ago. I acquired a new Regency-set romance (one by an author I'd never read before, in fact, though I read the blog she shares with other historical romance writers). I indulged my interest in Waterloo by reading Georgette Heyer's An Infamous Army. Then I bought Sherry Thomas' latest release--His At Night--which is actually late Victorian, but her writing is so good, her prose is so beautiful, that it made me want to write a historical romance again. I'm girly-geeky. I like a good historical romance novel. 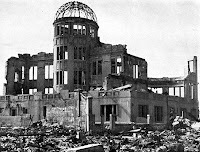 Today is the 65th anniversary of the dropping of the atomic bomb on Hiroshima. I was at my grandma's house today (well, yesterday) and the memorial ceremony was on TV (since in Japan, it was already the 6th). It was held in Hiroshima's peace park--right where the above building, which was damaged in the bombing, still stands as an eternal reminder of what happened.